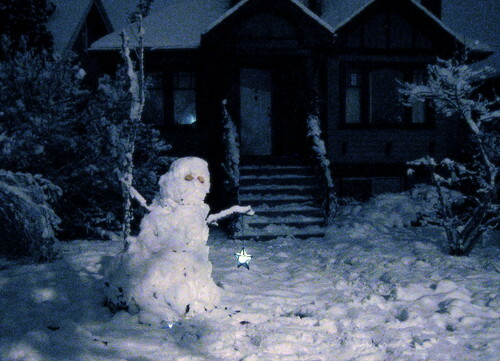 This is the fifth consecutive day of snow in Vancouver, and the third day of heavy snowfall. Vancouver really is not used to this. The trolly buses that I take to and from Yaletown have been simply awful — long waits, delays, random bus switches. The old tree in front of the Kommune has lost its two biggest limbs to the unfamiliar weight of so much snow, and our neighbour’s tree came down, taking out powerlines and a car. UBC was completely closed on Monday, and I suspect it might be tomorrow, too. And Vancouverites themselves are clearly not equipped to handle it. I see them, walking fast, shoulders hunched forward, trying to use umbrellas to ward off this unfamiliar precipitation. All violent shivering and chattering teeth, since they haven’t learned how to psych themselves out of being cold. I told a couple stuck in a snowbank how to get the car out — by rocking it forward and backward until it popped out. They looked at me like I told them to wait for fairies to fly it out, and then proceeded to put the pedal to the floor and spin their tires for about five minutes while yanking the steering wheel left and right. I actually find the whole situation kind of charming. In the rest of Canada, a late-November week like this would pass without comment. In Saskatchewan, it would be considered relatively pleasant. But Vancouver has been brought to her knees. midnight snowspirit, originally uploaded by Mister Wind-Up Bird. It started snowing last night in Vancouver, and hasn’t let up. Late last night, I went out and made a snowman to greet the winter with his ceremonial staff and candle lantern. “Eric,” I hear you asking. “What the heck you been up to lately?” Well, the past few weeks have been busy ones for me. The rest of the week I divide between school — I’m scheduled to do my PhD thesis proposal on Efficient Active Learning for Graphics and Animation next July — and a school-related programming side-project I won’t say much more about except that it’s unpaid, uncredited, time-consuming, doesn’t involve machine learning (any more), and has generally felt a bit Sisyphean. In my copious free time, I’ve been researching, planning and preparing for my Southeast Asia trip. Only three weeks now! And I still need a new backpack, a visa for Vietnam, dental work, new glasses… This is a pretty big deal for me. As long as I can remember, I’ve wanted to go to that part of the world. It will also be my first trip to the developing, non-English-speaking world. I mean, I won’t be straying too far from the regular backpacker trail, but at heart I’m just a simple lower-middle-class Saskatchewan boy who didn’t set foot outside of the prairies — or even board an airplane — until I was in my twenties, and it all seems pretty goddamned adventurous and exotic to me. Well, I’ve been pretty busy the past week or so. Last weekend, after talking to my friend, bodyguard and travelling companion, Janelle, we decided to skip Thailand’s Aussie-packed beaches and instead some more of Southeast Asia. My last trip (to Australia and New Zealand) was kind of about traveling around by bus, car, SUV, ferry and train, spending each night in a different place. This time, I wanted to pick a few places and spend enough time in them to get to know them. And flights in SE Asia are fairly inexpensive — you can see a lot of countries for the price of a round-trip ticket from Vancouver to Montreal. And so, my free time for the past week or so has mostly been about researching, booking, planning and replanning. But now, at last, I think I can tell you my itinerary. Arrive in Bangkok. Sleep (it’s an 18-hour flight with a 14-hour time difference). Take the train to Chiang Mai, an ancient city in the mountains or Northern Thailand, with walls, moats, old temples, and the like. There are lots of things to see in the area, too, like the laid-back little town of Pai. Fly to Luang Prabang, Laos. It’s a UNESCO World Heritage City, which I gather is a good thing to be. There’s a backpacker-oriented town nearby called Vang Vieng. 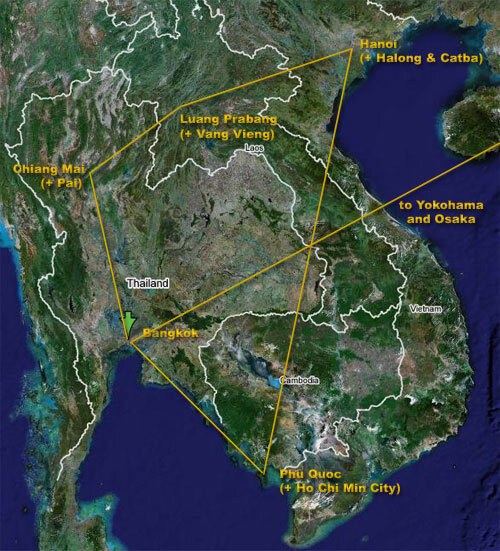 Fly to Vietnam for NYE in Hanoi. That should be interesting. Nearby are Halong Bay and Catba Island, which look astonishingly pretty. Down to the Island of Phu Quoc, just south of Cambodia, for a few days. Apparently, the island is lovely, and still somewhat undeveloped — I could only find about ten promising-looking places to stay, several of which had rooms available. Back to Bangkok! This time, to check it out properly for a couple of days. Off to Japan. I need to change my ticket still, but the plan is to spend a couple of days in Yokosuka and a couple in Osaka, hanging out with various transplanted Saskatchewanians. Back to Canada, a little richer and much more annoying for my experiences. 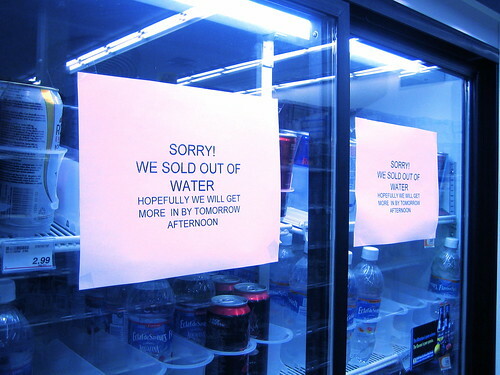 we sold out of water, originally uploaded by Mister Wind-Up Bird. Vancouver is indefinitely on a boil-water alert right now, thanks to mudslides (with potential bacterial contamination) around the reservoir. The turbidity, apparently, is at levels never before seen in Vancouver. Never. You can still drink the water if you boil it, but downtown especially, that just means you have boiled, brown water, which isn’t much fun. Living in Canada, every once in a while nature throws something like this at you to remind you that whatever you may think, once you get past the city limits, you’re surrounded by several million square kilometers of rather inhospitable and untamed wilderness. The fact that the past couple of days have been cold, windy, rainy and very, very dark adds a pleasantly apocalyptic tone to that reminder. Filed in photos by me, vancouver | | Comments Off on but what about the coffee?